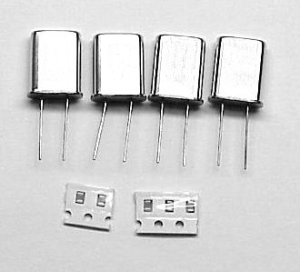 This low cost filter kit includes four specially cut and color coded crystals along with both five surface mount capacitors and a complete set of ceramic disc capacitors (picture shows only SMD caps, both SMD and ceramic discs are provided). Center frequency is 9000 kHz and impedance in and out is 200 ohms. This is just the ticket for that QRP receiver or transceiver project.